Marketers, brand managers, product managers and planners would be well advised to break down the organizational barriers that exist between themselves and those curious folks that populate the continuous improvement corners of the organization. The arcane (probably to most marketers) language and thinking of Six Sigma and Lean Six Sigma have tremendous application to the jobs and missions of the marketing world. For many years marketers have been schooled in the four Ps, product, promotion, price and place. To this list of Ps they need to add processes. Competing for customers in today’s marketplace is predicated on value – the organization that can achieve and sustain a value advantage is the organization that will enjoy dominant market share and greater profitability. Look to companies like John Deere, Caterpillar, Mercedes, BMW among some notable value leaders. Look to companies such as CNH, Ford, or GM as value followers. Customers want superior quality at a fair and competitive price. This is the essence of value and the driving force for the competition for a value advantage. For organizations to compete successfully on value they must take a holistic view of value that is based on specific market segments that use specific products. For example, farmers buying tractors to cultivate and harvest will define value differently than mining engineers that buy tractors to clean up mine sites. Similarly, young single heads of households purchasing a sports car will define value differently from married heads of households with children looking for a minivan. Much of this is intuitively understood but seldom put into practice. By defining value with this type of focus, marketers will begin to understand a much broader and extensive understanding of value. Too many marketers limit their view of value to the product – its features, benefits, etc. A more comprehensive view of value is predicated on the entire value delivery system. For a heavy equipment manufacturer this means not only the product with its features and benefits, but also the value that is delivered through the dealer network, parts, service and product support, and the logistics system that delivers attachments and parts to the dealer. A tractor that does not work because of the lack of parts is a tractor that delivers no value. Similarly, a tractor that is at the dealership awaiting attachments that have not been delivered is a tractor that is rapidly losing value in the eyes of a customer. A sports car that has been promised to a customer but can not be fixed at the dealership is also devoid of value. These factors are what the Six Sigma community calls CTQs or critical to quality factors. Value advantages and value disadvantages exist because there are performance gaps on the CTQs among the different competitors. For example, consider the Value Matrix shown in Figure 1. The Value Matrix for manufacturers of small tractors juxtaposes the key drivers of value, Quality (Customer Quality Index) and Price. The four quadrants are formed by the intersection of the market averages of performance scores on quality and price obtained through a survey of targeted small tractor buyers. This survey seeks evaluations of competitive products as well as the organization’s own products. The upper right hand quadrant is home to the outstanding value competitors because of their superior quality performance and superior price satisfaction. The poor value quadrant is populated by those competitors providing inferior quality and an unsatisfactory price. The expensive quadrant is so defined because competitors are perceived as offering superior quality but at an unsatisfactory price. The discount relationship quadrant is home to competitors offering inferior quality but at a satisfactory price. 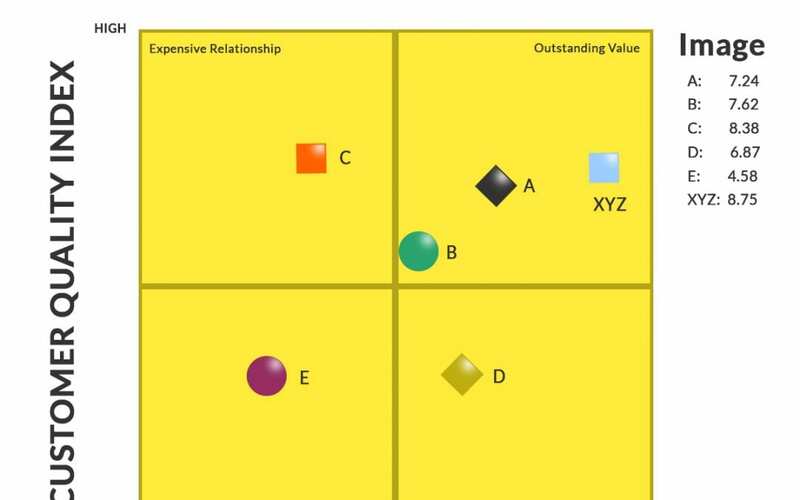 XYZ is located by customer evaluations in the poor value quadrant, a position it can not long endure. Strategically, its goal is to move into the outstanding value quadrant and as a target has focused on Competitor 1. The distance between the two competitors is the value gap that must be closed. Clearly much of this gap is based on inferior evaluations of the company’s product offering. The task is to address these issues and as the quality offering improves so too will the evaluation of the company’s price. After all, customers will be getting better quality at the same price! If given the task of improving quality under these circumstances, most marketers would be hard pressed to know where to begin. Where do you start? Lacking this information makes the job difficult if not impossible. Here is where the CTQs come into play. What are the CTQs that comprise the Customer Quality Index? The CTQs and competitors’ performance on these CTQs are shown in Figure 2. The number one CTQ for manufacturers of small tractors is dealer service. This CTQ is based upon performance for such issues as repairing tractors (shop repairs as well as field repairs), servicing tractors (both emergency and routine service), parts availability, and hours of operation. XYZ has a disadvantage to its target, Competitor 1, on this key CTQ. The number within the matrix are mean scores on 10 point scales ranging from 1 (poor performance) to 10 (excellent performance). The data comes from a value survey of owners of small tractors. Closing the value gap will require this manufacturer of small tractors to partner with its dealer network to improve dealer service. Repair, service, parts availability all are processes. The will not be fixed by applying the traditional 4Ps to this situation. They will be fixed by applying the tools and discipline of Six Sigma. Within each of these processes there is likely more than one project. Taking the typical repair process apart, for example, would reveal that there is an inquiry process where the customer calls the dealer, a scheduling process where the repair of service is scheduled, the transportation process, the repair process itself, a process of acquiring the necessary parts, and invoicing. Each is a potential project as defined as the voice of the customer. Clearly there may be some product issues, especially if there are systematic problems that show up in the repair system. These issues may be fodder for DFSS initiatives. Marketers operating within organizational silos that follow a strict functional orientation are ill equipped to address these value gaps in a systematic and effective manner. Value is delivered to the market place through an organization’s value delivery system. To either increase a value advantage or to lessen a value disadvantage, marketers must learn to work with these systems. These systems cross many functional areas within the organization and, in some cases, outside the organization. Simply advertising that the organization’s product or service offering provides the greatest value or that the organization’s performance on CTQs is unparalleled will not work. Failure to prove value superiority belies any promotional claims. There are several initial steps in integrating the marketing operations of an organization with those of its continuous improvement capabilities. Begin by understanding how targeted markets define value. Most organizations do not have a good understanding of how their targeted markets define value. Moreover, when pressed to provide an estimate of how well they are providing value to these markets they tend to overestimate their value delivery capabilities. Make sure the collected value information is not held captive by one functional area but is communicated across the organization. Focus on how customers define value, not internal personnel. Make sure that there is a holistic view of value, one that may go beyond the factory floor to include agents, brokers, dealers, branches, etc. Marketers, brand managers and product managers should include a black belt on their planning teams. Absent a black belt, someone from the quality area of the organization should be included. Their training can provide insights into how the value delivery systems can be enhanced to provide improved value to targeted markets. Black belts should be invited to present Six Sigma basics to the marketing side of the business. In many organizations these areas do not communicate in a way that provides meaningful cooperation. Six Sigma basics can help expand the tools kits of marketers. Organizations that have not made a commitment to Six Sigma should. But having made that commitment do not isolate it and do not focus it solely on cost cutting. There is a strategic role for Six Sigma that has yet to be embraced on a large scale. Organizations that are typically internally focused will ply the discipline of Six Sigma internally. Those that are customer focused will understand the greater strategic role that Six Sigma can play. Organizations will have to invest in customer information systems that provide more powerful actionable information. Report card systems are inadequate to inform the more strategic applications of Six Sigma. A frequent concern that is heard from many black belts is that they are running out of meaningful projects. They have focused their Six Sigma initiatives on virtually all internal issues. Turning their focus to external value delivery based on customer input will provide a continual source of new projects designed to enhance the organization’s competitive value proposition – and a superior value proposition will result in increases in market share and overall profitability.